In the past year (4 quarters with Cisco's Network Academy and a few months of self study) I learned all I could about the Cisco CCNA. This entailed lots of lab time on the 1760 router I own, Packet Tracer, and GNS3. I spent a good amount of time searching the web for lab resources and want to share them in a series. I may only write a couple of posts on it, but I wanted to be able to put a collection together. The first up is howtonetwork.net's free labs. There is 101 free labs and they are great. Simple instructions, easy to blow through for practice and to get your pace up to exam standards. They are "unanswered" labs (challenge labs I guess they're called) so, once your finished, connectivity will tell you if you've done the lab correctly. If you need the answers or a walk through for the labs, you can purchase a book of all 101 labs for $297.00 which includes lab videos and other tid bits (the book alone is $85.11 at amazon). A bit more reasonable, you can also become a platinum member of the site for $30.00 a month and then have access to lab walk throughs. I think the member route is a lot more economically viable and the site offers some nice features like a 30 minute audio cram review, included rack time, a CCNA study book, amongst other things. How to network.net are the folks that put out the site subnettingquestions.com. So, shifting focus to the Security+, the SY0-201 exam is EOLed at the end of the year (20111231). I had taken a class with my local brick and mortar school in early 2011 covering the first half of the Security+ information which included Testout's Labsim SY0-201 (linked) course. Normall $495.00 (ouch) the cost was greatly reduced through school to $60.00. So, I want to try to sit for the exam prior to the (Labsim) material being out of date. I've started to skim the Gibson material and took a 66% on the initial practice test (85% required to pass). 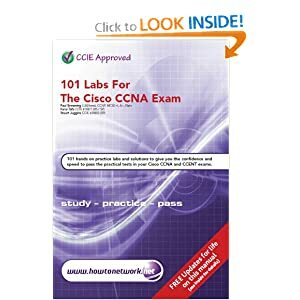 I will get into full swing after passing the CCNA. This will be interesting to see how it goes through the holidays. I'm thinking the down time will give me time to read / study more. Well, hopefully. 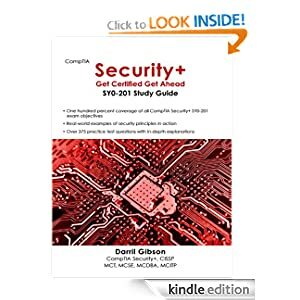 As a side note, if you'r looking to take the SY0-301, the updated Security+ exam, Gibson's new book is out in print and discounted for a limited time. See his blog post here for more information. Well, it's been about 3 weeks since my last post. 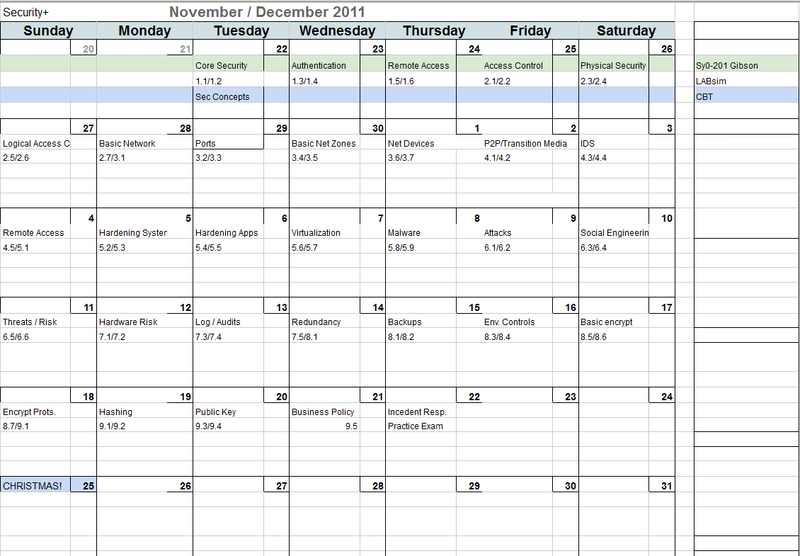 I finished my crazy 35 day schedule and sat for my CCNA exam. I failed the exam scoring just shy of the needed percentage points. The reason I failed was due to poor time management. I got stuck with a multi question simlet that took a lot longer than I would have liked and time simple got away. Not to mention the 1st time Cisco exam jitters. So, the last week I have spent sharpening up the skills on the sims as I lagged on them and taking nightly pretests. I figure if I would have had an extra 10 minutes I would have finished the questions and passed. That 10 minutes was soaked up by the sims, so the simulation topics are my focus. 90 minutes/72 normalized questions = 1.25 minutes (1:15) normalized question time"
So, I have rescheduled the CCNA and will sit it again in a few days. Then its on to the Comptia Security+ SY0-201. I'm hoping to finish that off before years end.